Risotto is a great comfort-food dish, yet it also can be loaded with fat from the addition of butter and cheese. 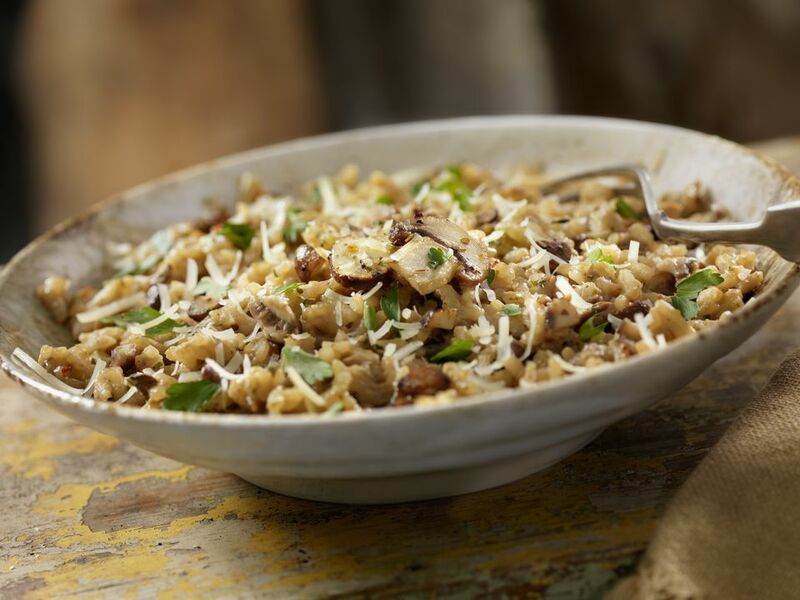 This low-fat mushroom risotto recipe uses olive oil instead of butter and eliminates the cheese while adding plenty of flavorful aromatics, herbs, and vegetables to boost the taste. Risotto is gluten-free friendly as long as the broth you use is a gluten-free brand. And if you're feeding vegetarian friends, it can be a main course if you use vegetable broth rather than chicken broth. Pour broth into a 2-quart saucepan and heat over medium heat until simmering, but not boiling. Keep warm. Heat oil in a large skillet over medium heat. Sauté onions and garlic until softened and fragrant, 3 to 5 minutes, making sure the garlic doesn't brown. Add rice and sauté for 1 minute, stirring to prevent sticking. Sprinkle with dried herbs and add mushrooms; sauté until they release their juices, 5 to 8 minutes. Add white wine and stir. Once the wine has been mostly absorbed, add the hot broth, 1 cup at a time, stirring and waiting until each cup of broth has been absorbed before adding the next. Add the spinach before adding the last 1 1/2 cups of broth. Add the remaining broth and stir until absorbed. Risotto is an Italian dish made from Arborio rice, a rice high in starch that results in a creamy texture when combined with hot stock. Although the final dish is simple and can be an all-in-one meal, risotto is somewhat labor-intensive to make—you need to stir constantly as you slowly add portions of the broth to the rice until all of the liquid is absorbed and the rice is firm but creamy. The result, however, is worth the effort!